Angels Landing is the name of an impressive rock formation in the Zion National Park, in the U.S. state of Utah. The path that leads to this unique place that, according to its name, angels land here, is an extreme experience and not for people who have fear and phobia of heights. Angels Landing is a formation that reaches 368 meters high and is hewn into the rock path, being "guarded" by two gaping chasms on either side. Formerly known as the Temple of Aeolus, the rock formation Angels Landing stands at an altitude of 1763 meters, the height of which reveals an impressive view of the Zion canyon. Below, the site is surrounded on three sides by the Virgin River. Angels Landing is considered the best place for monitoring within the park, as it offers a comprehensive view to the base of the canyon and the rock giants surrounding. The path that leads to Angels Landing is popular and well maintained, but the vast height of the transition is a stumbling block for many people. Its length is slightly less than 4 km, the transition starts from the Grotto Trailhead and follows the western part of the canyon, West Rim Trail. The last part of the route is through the spine of the rock formation, which remains seep with a height of 1500 meters. The trail was carved into solid rock back in 1926. Before reaching a final point, do not forget to look down if you have courage. 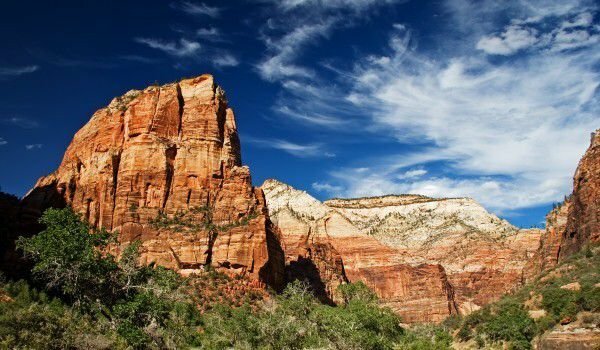 There are several places to rest if you want to stop to catch your breath and gain courage for the last steps of the route to Angels Landing. For people who have no experience in mountain climbing and rock climbing, the transition can be really disturbing and frightening, but when you reach the end, rest assured your efforts will not have been wasted. It is important to note that this extreme excursion is not suitable for people in poor physical shape. It is forbidden here, to bring small children. For decades many people have died en route to the Angels Landing. About 5 registered deaths are there since 2006, and the number is growing. One of the latest casualties was in April 2010 when a woman fell half a mile from the Angels Landing. Is the busiest trail in the afternoons of the summer. According to local safety service is good move on the path to it with metal chains which are secured periodically. Even in dry weather, the rocky terrain can be very slippery. Place where one can obtain a tourist base is Zion Lodge.